BAHAMA BLUE STRIPE SINGLE HAMMOCK home decor, jewelry, decor, decorations, electronics, fountains, floor mats, art glass, vases, garden essentials, fireplace screens. Say goodbye to your cares for a few moments while enjoying the summer shade! 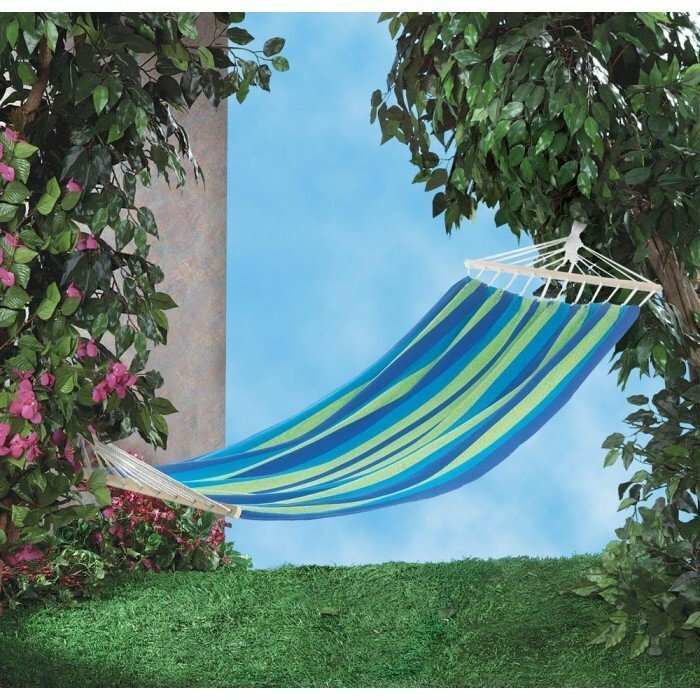 This fantastic cotton hammock features tropical blue and green stripes, cotton rope and wooden dowels. Hang it in your backyard for the perfect spot to lounge. Maximum weight limit: 350 lbs. Material(s): COTTON WOOD METAL. Weight: 3 pounds. Dimensions: 78.8" x 39.4" x 0".